Soft Whole Wheat Caramel Chip Cookies that are made with white whole wheat flour, no one will know that these cookies are whole grain. We had a snow day yesterday, and it was glorious. We got over 18″ of snow and it was blustery all day. My windows are covered with so much snow you can barely see outside. We spent the whole day reading, doing crafts, napping, and watching movies. It was such a nice day. I love having a day when we have nowhere to go, nowhere to be. In this case, we couldn’t really leave if we wanted to. I think that looking back, I will remember snow days as some of my favorite days spent with my little family. I’ve been doing a lot of baking with my kids lately. 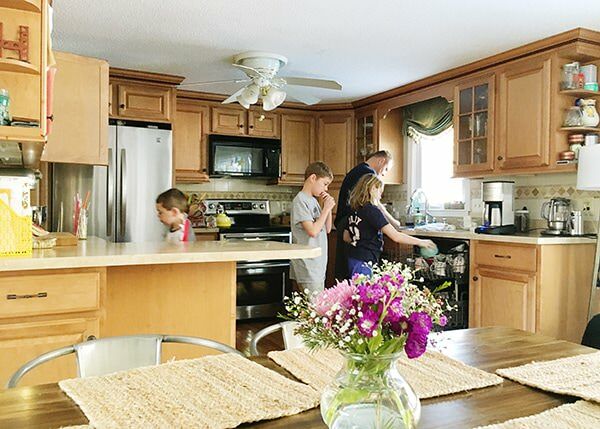 They are finally at the ages where they are helpful in the kitchen. I can give them a simple recipe and they can do it themselves with minimal supervision. The best part, they now have to clean up themselves. 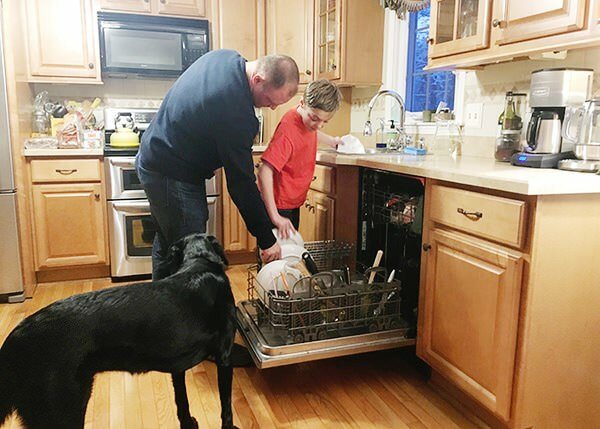 We have been giving them lessons on how to loadthe dishwasher. I had no idea how much of a lunatic I am about loading the dishwasher until I had them do it. I’m a total control freak. When they went back to doing whatever they were doing, I went and rearranged everything. I was flipping through the King Arthur Flour catalog and there was a recipe for chocolate chip cookies made with white whole wheat flour. I’ve never really baked with that kind of flour before, and I am now finding ways to sneak it into everything. This recipe was the first I tried and it was a huge success. I didn’t have enough chocolate chips, so I used a bag of chocolate covered caramel chips. The resulting cookie was a soft and delicious and they all disappeared right after I made them. This recipe is worth grabbing a bag of white whole wheat flour to play with if you haven’t tried using it before. 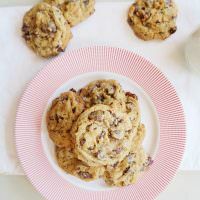 Also – this recipe calls for espresso powder, it doesn’t make the cookies taste like coffee (no one even noticed it) but it brings out the flavor in the chocolate so try to not skip it. 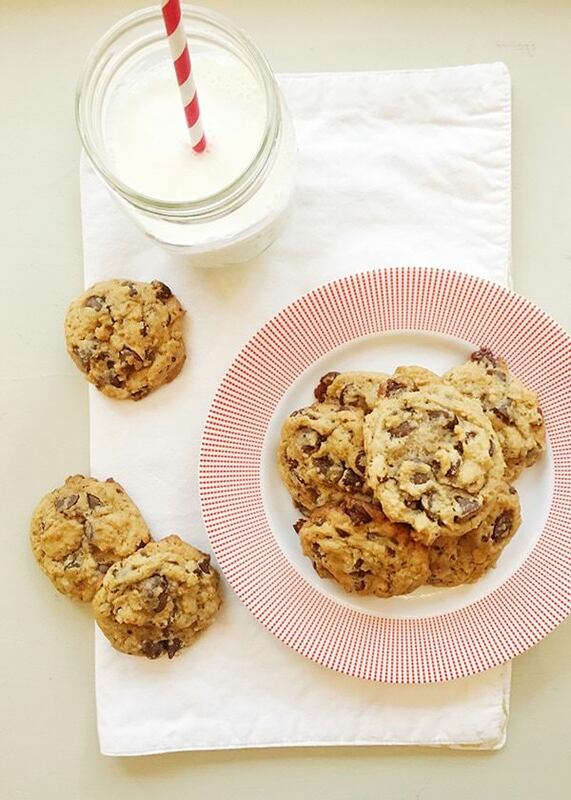 Soft and chewy caramel chip cookies made with white whole wheat flour. No one will know that these are whole grain. Cream together butter, sugar, light brown sugar, honey, vanilla, espresso powder and salt until light and fluffy, about 2 minutes. Scrape the bowl. Add vinegar, egg, baking soda, and baking powder. Mix until combined. Add in the flour and mix until just combined. Stir in chips. 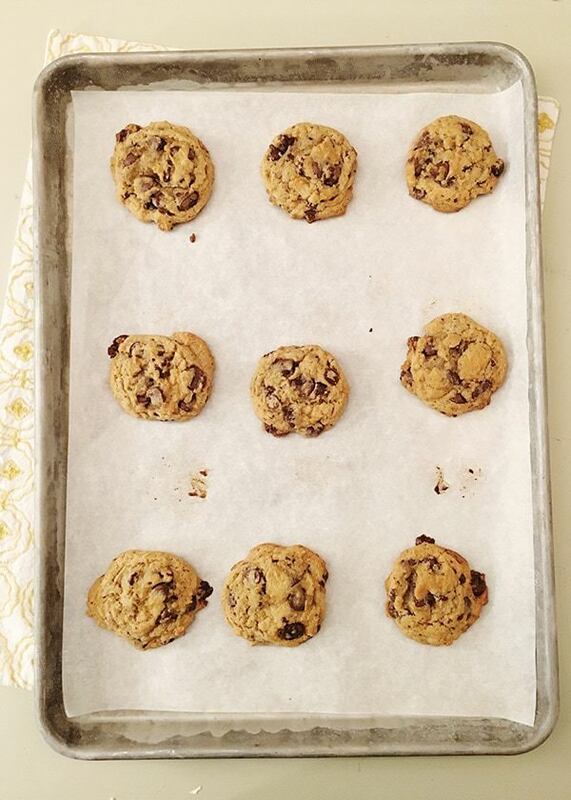 Drop a tablespoon of dough onto baking sheets. Bake for 10 to 11 minutes, or until the edges barely begin to brown. They may look a little under cooked, but that’s okay. 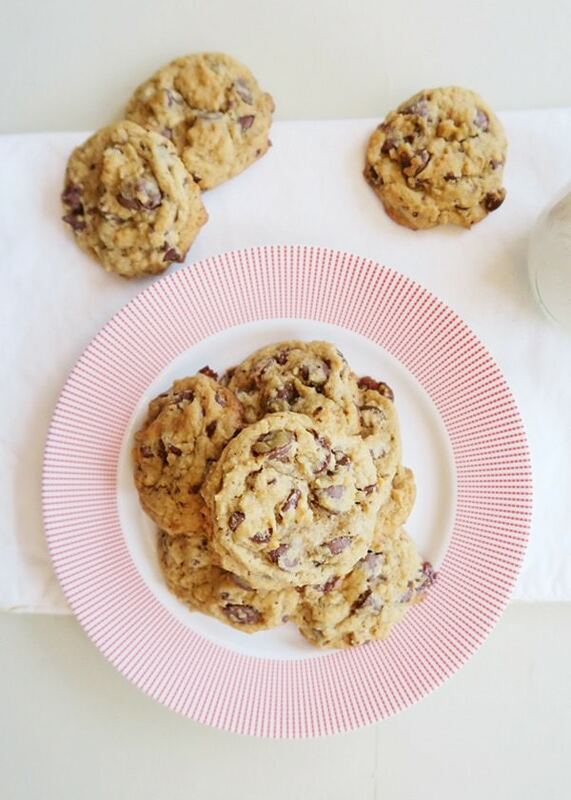 Take the cookies out of the oven and let cool on the pans for 10 minutes before transferring to a rack to cool. Recipe adapted from King Arthur Flour catalog. Cookies look yummy but the Clementine cake is on my to do list this week! The clementine cake is so good, I hope you liked it. I am not familiar with chocolate covered caramel chips. What is the brand name? What are chocolate covered caramel chips?